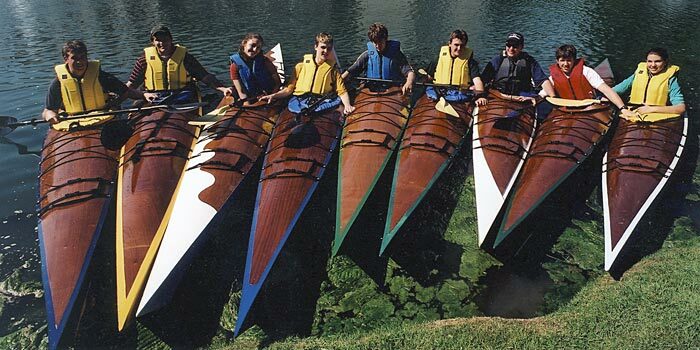 From the Hill School Press Release " Instructor of woodworking, Luke Block, and his class at The Hill School of Pottstown, PA built 16 CLC 17 LT Sea kayaks. The boats were first launched on the Hill's own Dell Pond in late May 2002, as the opening feature of the school's year-end art exhibit. From left to right student boatbuilders are: Bill Bonin, Will Campbell, Julia Melle, Luke McAvoy, Brendan McGowan, George Van Horn, Mr. Block, Tom Manzo, and Megan Gerrard. In early June, the class and faculty chaperones took a four-day trip down to Maryland's Audobon Sanctuary for some real paddling off the shores of the Chesapeake Bay. The Hill School is at 717 East High Street in Pottstown, PA 19464-5781.